A few days ago on the TOS facebook page I posted the photo above, along with this challenge: “Here’s a shell you don’t see on just any sandy beach. Any guesses about what it is?” There were some great guesses but nobody really nailed it. This is a piddock shell, probably the flat-tip piddock, Penitella penita. Piddocks are bivalves – mollusks with two shells and a hinge, like clams, oysters and mussels. From the beachcomber’s point of view, piddocks have a patchy distribution. 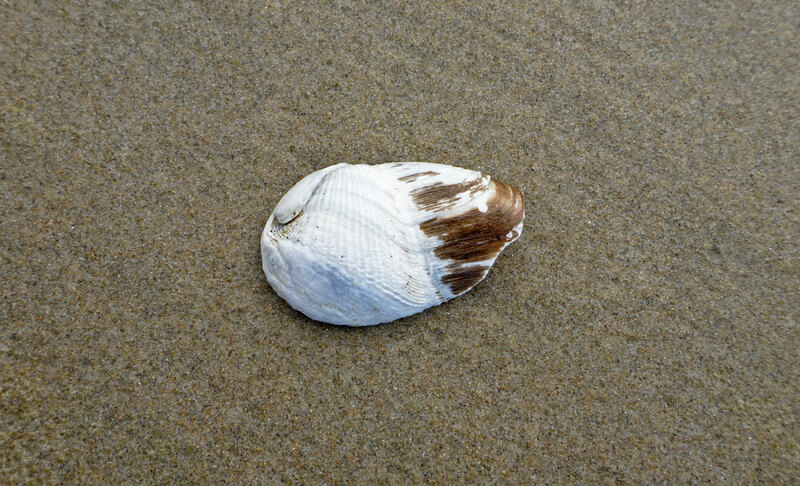 Flat-tip shells wash up frequently on some beaches but only rarely on others. Penitella penita is found from the mid-intertidal into the subtidal zone but it can’t make a living in shifting sands. They live in individual burrows in a variety firm substrates. Most of the field guides say clay, mud and soft rock, especially shale, but they can bore into substrates harder than shale. Ricketts and Calvin (1968) say P. penita “…drills into rock so hard that nothing short of a sledge hammer powerfully swung will break into the burrows…” I can’t get enough Ricketts and Calvin. The burrows of P. penita are formed mechanically. A muscular foot on the anterior end creates suction that allows the rasping anterior surface of the shell to work the rock. Over time, the burrow increases in length and the clam, along with its hard shell, grows. The result is a large clam trapped in its burrow by a small opening, and this is why the casual observer is unlikely to see a live flat-tip. Why do we see lots of shells on some beaches but not on others? I have a feeling that the right kind of substrate in the intertidal and nearshore waters is uncommon and patchily distributed. If true, that would pretty much explain the pattern. Where the right substrates exist, piddocks can be fantastically abundant. Something tells me not to expect to find a whole lot of P. penita shells on the beach because they are entombed, as I described above. But I guess it’s possible that normal weathering is sufficient to mobilize plenty of shells. Disturbances could mobilize even more piddock shells. There is no question, some clammers have a taste for piddocks and their methods of picking away could account for some of the shells that wash up on certain beaches, but I have never observed this. If you want to learn more about these seldom seen rock-boring bivalves and see some great photos too, don’t miss what Dave Cowles has to say in the Walla Walla University species account. I photographed the piddocks in this account on November 2, 2013. If you want to see some other things that washed up on the beach and caught my attention that day, go to Wrack Line 2013 and scroll down to November 2. Harbo, R. M. 2007. Shells & Shellfish of the Pacific Northwest. 3rd printing. Harbour Publishing. A few years ago my wife and I were camped at Cape Blanco State Park. We walked down the steep road leading to the beach on the south side of the campground. Much of the rock was soft sandstone and it was full of piddocks. First time I had seen them in nature. I’d like to see that. Sounds like a great field trip idea. Thanks for the tip.